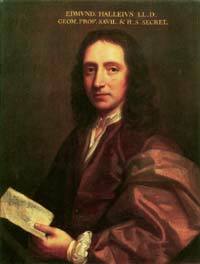 Edmund Halley was an English astronomer and mathematician who was brought up in a wealthy family. His father was a soap maker from the Derbyshire family at a time when the demand for soap was increasing in Europe. Although the father lost a lot in the 1666 Great Fire of London, he could still afford his son’s education and also pay a private tutor. After joining St. Paul’s School, Halley’s true astronomical talent started showing. At the age of 17, Halley joined Queens College in Oxford with astronomical expertise practiced by the assortment of instruments his father had bought him. He reinforced his talent by working with John Flamsteed, who was the Astronomer Royal in 1675. His work encompassed observations at Greenwich and Oxford. During his Oxford studies in June 1676, Halley observed an occultation of Mars and since then proposed to move to the Southern Hemisphere to carry the same observations. This idea was modestly financed by his father as well as King Charles II. The King personally issued a letter to the East India Company to take Halley and an assistant to St. Helena. Also the president of the Royal Society, Brouncker, and the founder of Royal Observatory, Jonas Moore, supported Halley’s endeavors. This marked the start of his road to success. At the Island of St. Helena, Halley recorded celestial latitudes and longitudes. When he returned back home in 1678, he had observed up to 341 stars including a passage of Mercury along the sun’s disk. His published catalogue was the first one to contain southern stars with telescopically locations. As such, he was promoted to be a fellow of the Royal Society. In his service, he was sent to Danzig to resolve a dispute between Havelius and Hooke concerning observation accuracy. Hooke sued Havelius for making inference without using the telescope. Halley’s verdict was that the observations were accurate. Nevertheless, Halley’s chief motive was to explain planetary motion using celestial mechanics extended from Isaac Newton’s studies. Together with Robert Hooke, they made impressive progress, but with no solid observed orbits that could support their findings. In 1704, Edmund Halley was appointed the professor of geometry at Oxford, but he still persistently studied astronomy. In 1705, his book, A Synopsis of the Astronomy of Comets, was published and it described an observation of parabolic orbits of 24 comets that were observed between the years 1337 and 1698. Halley’s careful observations with many separate years reveled that comets travelled in similar orbits. Particularly, he saw that the comets of the years 1531, 1607, and 1682 were similar and thus same. In fact, he further predicted that the comet would return in the year 1758 and when it did, it was named Halley’s Comet to honor his discovery. In a nutshell, Halley’s transition from theoretical to applied astronomy has made him iconic and a symbol of inspiration to young astronomers. In his time, he also devised methods of accurately measuring the distance of the earth from sun. In 1720, he took over as the Astronomer Royal of Greenwich until his death in 1742.